Heather Valentine from The Sewing Loft and I ( gogokim) are hosting a #missingmarket event on Instagram please join if you can. If you are not on Instagram, we did not want you to miss out on the opportunity to grab some Market goodness so we are hosting a sponsored giveaway! 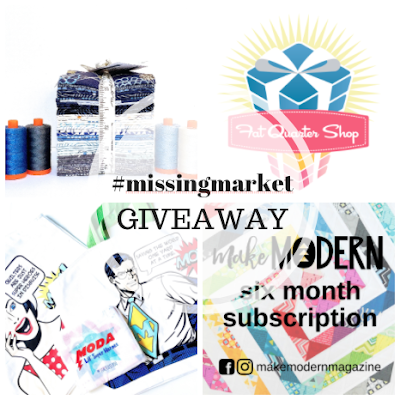 Industry leaders Aurifil, Fat Quarter Shop Moda Fabrics and Make Modern Magazine want to make your want to make your Missing Market much easier with a giveaway! One fat quarter bundle of the delightful True Blue fabric collection by Zen Chic for Moda Fabrics courtesy of Moda Fabrics! Six spools of coordinating large spools of Aurifil 50 wt thread colors 2024,2309, 3770, 2725, 2780 and 1246 from our friends at Aurifil! A $50 Gift Card from the very generous Fat Quarter Shop! Also from our FABULOUS friends at Moda is this SUPER SPECIAL SUPER HERO Bag ( only one bag for the giveaway but I had to show both sides!) and a Moda Lil' Super Heroes kit so you can make a stuffed super hero or the kids in your life! The kit includes both a boy and a girl super hero! 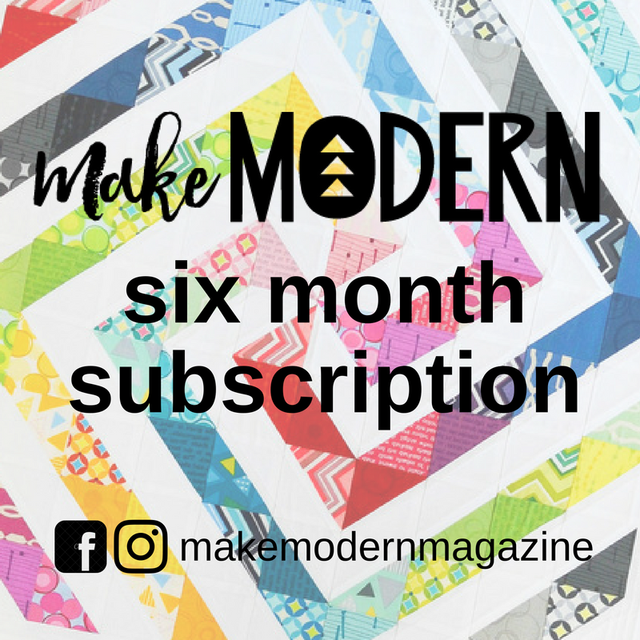 The wonderful peeps at Make Modern Magazine is providing a six month subscription to fill your days, nights and weekends with loads of inspiration!!!! This giveaway will be run through Rafflecopter. You are not required to do all of the options listed but your chances of winning will do increase with the more options you choose to do. The giveaway is open to all of our international friends! There will be only one winner. The giveaway closes at 31 Oct 2016 at 4pm CST ( the same time as the close of Quilt Market) and a random winner will be chosen from Rafflecopter and contacted by on or by 03 November 2016. Many thanks to our sponsors for this really fabulous opportunity! I find Instagram to be a great resource for finding new fabric lines. Designers and quilters use beautiful photos to make us "crave" their fabrics. I rely mostly on online fabric shops e-mails. The other place for me is projects on blogs. We have a small quilt/sewing machine shop nearby that I shop, but I do a lot of online shopping for the majority of my things. I find the internet is where I discover what is new and upcoming and hopefully my LQS will eventually bring in my favourite lines. I try to shop local as much as possible, but I don't live in a big place, so sometimes I have to outsource! Loving all the quiltmarket pretties though! I get new fabric news mainly from Facebook and Instagram. I get new fabric news from blogs that I read and newsletters from designers and fabric stores. Thank you so much for this giveaway! Currently, I don't get any new fabric news. My favorite quilt shops and blogs and their newletters! I get my new fabric news from blogs and facebook post from designers and quilt shops. I receive newsletters from fabric shops, quilt bloggers and fabric manufacturers with new collections information. I also read about new collections through Bloglovin. I am not on Instagram so do not use that social media. I follow Blogs and get newsletters to keep up with quilting news, I missing market! Probably Facebook first and then my LQS second and via email from blogs I follow after that....what a scrumptious prize! Facebook and Pinterest are my main source of information! IG is a great source for finding fabrics and fabric sales. I use many sources but like to shop local...unless I see something I just have to have now...then a little online shopping is in order. 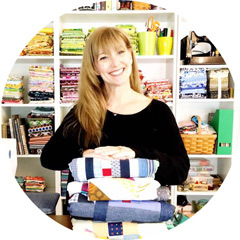 My favorite way to see cool fabric is by following my favorite quilters on social media. I get my news from following blogs of the 'movers & shakers' in the fabric world - designers, manufacturers and stores. Pinterest is also a good source for watching trends. Mostly from my LQS Mailer; also from on line Quilt Blogs. I learn about new fabrics mostly from blogs or from emails from bloggers and/or online fabric shops. I am mostly getting news from Instagram. Sometimes Facebook. I mostly hear about new fabrics through blogs and instagram. usually, by the time i see them in magazines, social media had already been saturated. :) thanks for the fabulous giveaway! I'm sitting over here drooling! So fantastic! How sweet of y'all to think of us! Thank you for the swag giveaway. Blogs, Facebook, and store newsletters. i see new fabric updates & instagram & blogs! I love seeing all the different fabrics, patterns, and ideas on FB, Instagram, and the different blogs I follow! I'm new to Instagram but love your blog, and follow you on FB. Thanks for all the inspiration. I belong to sevveral facebook groups that discuss new fabrics. Newsletters from online fabric shops and the mfg web sites are where I get most of mine. Instagram, blogs and severally local quilt shops are where I see new fabric lines. I get updates through emails, FB, IG. Thanks for the great giveaway. I'm on IG, but this is easier for me. Facebook and my local fabric store. All of my fabric interest comes from blog posts and emails from designers that I love? I get updates from blog posts and Instagram. I get new fabric information online. Thank you for a chance to win these awesome prizes. Most new fabric information I get from blogs via Bloglovin and Instagram. I follow a few manufacturers on Facebook, and many, many quilting blogs' posts through Bloglovin'. If the local freeway reconstruction is ever done (2018, they say) I can get to the local quilt shop more often to see what is new. Mostly Instagram and blog hops. My new fabric news comes from blogs I follow. I get my fabric news from bloggers that I follow and newsletters from quilt shops and manufacturers. I usually find out about new lines online -- from blogs or newsletters. I do love seeing them in person at brick and mortar stores too. Quilting blogs are my main source for fabric news! Usually it is quilt blogs, facebook or Pinterest. FB, blogs and some E-mails. I love seeing the new fabric. I follow my fav designers and fabric lines on Instagram. Also I sign up for blogs. Love getting the latest news and upcoming releases, also what's trending. I shop online frequently because only 1 LQS near me. Blogs give me a lot of info, plus magazines. Would love to shop locally, but with fabric at around $25 a metre here in Switzerland, and really no choice to speak of, it's generally online. Or on holiday! I get my info from various places. First and foremost is directly from Moda, specifically on their website. Designer blogs is another source for me. My subscribe to my favorite designers newsletters and blogs and they announce when they have a new line coming out. I think the last one would have to be youtube.com. I have numerous subscriptions to designers and tutorials and they announce fabric trends and new lines there too. I visit the local quilt shops, but don't always find the fabrics of my favorite designers at them. I do order a lot on line, especially from the Fat Quarter Shop, Hawthorne Threads and Etsy. Thanks for the giveaway. I almost always buy mine from online fabric shops. Thanks for the chance to win. I shop online and at my local quilt shop. Thanks for making the competition international. Us U.K. fans rarely get to join in. since there are no local quilt shops. Thanks for sharing the swag. I find about the new lines of fabric from the several fabric sites I receive email from. Many of the quilters & designers I receive email from are also a wealth of fabric information! The web is my go-to for seeing new fabric lines. I read lots of blogs and cruise lots more for pictures and inspiration. Thanks for the great giveaway. First I love to pet fabric! Lol! So the lqs shops in Amish Country are my first places to go see/get fabric, then I'm an internet stalker and love finding fabric and great deals! Thanks for sharing the swag! I get my fabric news online: from bloggers (like you! ), from several online quilt shops, and from Pinterest. I find out about fabric when people put it on their blog. I keep up with new fabric lines by reading my blogs. This is a great giveaway. Thank you for the chance to win. Matsche.christine@yahoo.com. Mostly from Facebook and newsletters from online quilt shops. I use local shops, Facebook, and I have used online shops just recently as well. I prefer to feel the weight of my fabrics and have been pleasantly surprised by the fabrics I have gotten through the mail! I get my new fabric news from Instagram, Facebook, emails & newsletters, and in my local quilt shop. Thanks for the giveaway fun! Facebook and blogs are where I generally find out about new fabric lines. I get my new fabric ideas from magazines, online fabric stores, blogs, instagram, and facebook. Social media is a huge resource for me as magazine resources dwindle. I get most of my fabric news from the shops I go to ~ Cool Cottons, Modern Domestic and Fabric Depot here in Portland, Oregon. Then blogs, like yours! I see new fabrics in magazines and shop newsletters via email. I see new fabrics on line using Facebook, Instagram, and blogs. I love seeing the new fabrics in my LQS because I can touch and fondle them. I'm a bit of a stickler for the "hand" of the fabrics. I get my fabric news from blogs and Facebook. I see new fabric lines on Twitter and online fabric shops. It's fun to dream of new projects using such beautiful fabrics! I shop at my local store and online when they don't carry what I'm looking for. I get my news from social media. I get new fabric news directly from (some of) the manufacturers blogs/newsletters, which, if available, include free patterns. What a great giveaway! I love to watch all of the market posts on Instagram to see the new lines! Thanks for the chance! I get my new fabric news from various blog posts or newsletters to which I subscribe. Don't do instagram (as have no cell phone). Do have many FB's that I follow but prefer the blogs/newsletters. Always fun to see what's new!!!! #missing market has been so much fun! Seen some great quilters and posts! I've made new friends! Great giveaway! I follow a few blogs that describe new fabric lines but my best source if Facebook, where a few of my favorite shops post the "just in" fabrics. What a great giveaway ! What a great giveaway.... would love to win, but good luck to all! New fabric news from FB, blogs, online shops and magazines. Emails, blogs and magazines, I'm no longer on Facebook too many privacy concerns. I mostly see new fabrics from the many blogs I follow. Facebook, bloglovin, and emails from online stores. I spend more time on the computer than I do quilting because of all the information. I do not do instagram as it would take even more time away! Shop newsletters are a great way to get the news of latest fabric releases. Usually through my blog roll or Instagram. But mainly the blogs I follow. I get most new fabric news through email newsletters an d blogs. I get my fabric news blogs and email. Would love to win your great giveaway! I get my news from my local quilt shop and online shops. Thanks for the chance to win this fabulous prize! I get most of my quilty news from feeds I follow on Bloglovin and Facebook. I get most of my new fabric "news" from designers, fabric companies and fabric stores posting on Instagram. I get my info from online quilt shops and Bloglovin. Love the swag, Thanks for the giveaway! I love my local quilt shop where I can touch and feel the fabric before buying but I also get lots of news from the blogs I follow. I get my info from different blogs, emails from blogs, facebook, and instagram. I usually count on my RSS feed, I have a number of prolific bloggers who are usually on top of it! Old school. I rely on email, pinterest and my quilting buddies to share news and new things with me. I'm one of those quilters that only gets one hit on rafflecopter ... "the comment" on the blog (from email). If I get to work without my cell phone, I'm okay with that -- it doesn't change my life. I get my info from magazines & the many blogs that I subscribe to. I primarily get my fabric information from reading blogs and Instagram. Blogs, emails, online fabric shops, and local quilt shops keep me informed. Thanks for a luscious giveaway. I get my info from online fabric stores newsletters, blogs and instagram! I get my fabrics on a variety of ways - I love to visit quilt shops when I'm away on vacation, I go to the closest store, there are two small home-run businesses close by, and I order some on-line, mostly in a kit. I'm afraid I have a bit of a fabric addiction happening! What a great chance to win! I missed the market and I love the blue. I buy local, but find that my local shops rarely have what I'm looking for if it's something specific. I rely primarily on Instagram (and secondarily on online shops' newsletters) to learn about fabric lines that interest me. Hiya!!! I receive posts from a lot of bloggers and emails from a lot of online shops. These are all so helpful with new inspirations for my quilting. This is a fantastic giveaway. Thank you so much for the opportunity. Blessed be, hugs!!! I get virtually all of my information from online bloggers , shops and magazines. Only fabric shop near me is Joann's. No quilt shops at all. I get several newsletters with fabric line announcements plus I follow lot sof designers on IG - they share their new fabrics and sneek peeks!! I rely on emails from the fabric companies and online fabric shop's newsletters to learn about new fabric lines. I am finding my best source lately is Instagram which leads me to blogs and FB pages. Great giveaway!! I love seeing new fabrics on Facebook, and blog posts, and then looking for them in the shops. Thanks for the give-away. I'm on FB Instagram and Bloglovin and pick up,ideas (too many) everywhere. I get new fabric news from blogs, newsletters from fabric manufacturers, and Facebook. I get mine from instagram and shop newsletters. I get mine mostly from Facebook. I just opened an Instagram account, but haven't really gotten into it yet. Thanks for the chance to win this awesome giveaway! Wow! I rely on recommendations on Blogs. It seems like more people are using Instagram than their blogs, so I followed them there for inspiration. I mostly follow blogs and there is some great stuff out there! This fabric would tic a blue and white quilt off my bucket list! Thanks for the giveaway! I find out about new fabrics from many sources, including Facebook, emails from quilt shops, blogs, and fabric stores. I Love this opportunity... Thank you so much. Love your blog. I usually will find my fabric from emails and Facebook. I am on Instagram and will surly add you. Blogs and IG, but blogs mostly because there I see the fabric used in actual projects which I find very inspiring. Thanks! I source fabric from LQSs, chain stores and online stores. I find out about new fabric online. following blogs and Instagram feeds are ways I find out about new fabric. I try various brick and mortar shops first, but wind up buying a lot online! I find out about new fabric from the blogs I follow! Goodness! Such an awesome giveaway! I get fabric ideas several ways but mostly awesome blogs ( thank you Kim) and Instagram or Facebook pages. Thanks for such a fun weekend on IG and tbig thank you to the awesome sponsors of this giveaway! e-Newsletters and blogs. Personally not a big fan of FB. I get a lot of shop (both online and brick and mortar) email newsletters and blog posts, and I think I get most of my fabric news from them and from the individual bloggers that I follow. I get most of my new fabric news from quilt shop newsletters and blogs. Thanks for the chance to win! I get all my info from Facebook and my quilting guild! I get most of my news from the quilt blogs. I mainly find new fabrics from swooning them on IG. But sometimes it is simply stumbling upon them in shops.